Beef jalfrezi and chicken tikka masala at Indus Village in Berkeley. It’s no secret that Berkeley is home to countless South Asian restaurants, and it’s easy to get lost in the mix. But Indus Village is a notch above the others, and that’s saying a lot. When I asked my friend Veena for a new recommendation, she listed Indus among her favorites, and now it’s one of mine too. 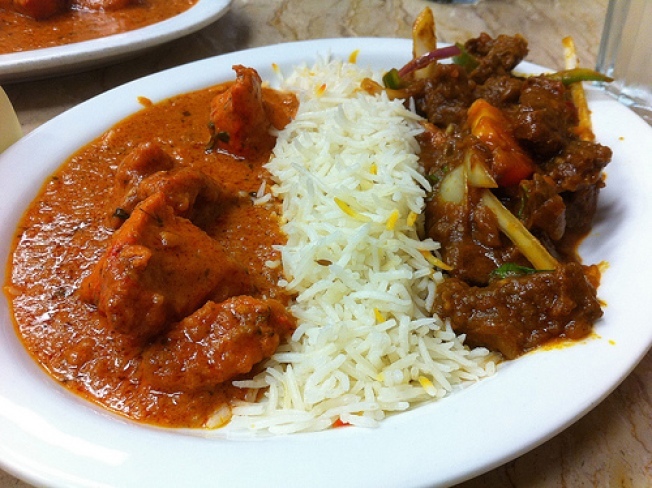 Nestled on San Pablo Avenue among a string of halal markets and sari boutiques, Indus Village offers all the usual South Asian fare like okra masala and chicken biryani, plus an impressive list of halal Pakistani regional specialties like goat karahi and lamb nihari. During my first visit, I was craving the ubiquitous chicken tikka masala, which I ordered alongside beef jalfrezi and basmati rice. The tikka masala had an underlying smokiness that I haven’t tasted anywhere else, and best of all, it wasn’t as cream-laden and unhealthy as most restaurant’s renditions. The jalfrezi was rich, oniony, and delicious alongside the fluffy rice. I washed it all down with a refreshingly salty lassi. Indus Village is ridiculously well-priced and the service is friendly too. I’ve been back countless times since my first visit (in fact, it was the first restaurant I ate at when I returned from my last trip, exhausted and in need of fortification), and I’m yet to have a disappointing meal. It’s no wonder Indus Village is always busy, despite the stiff Berkeley competition.